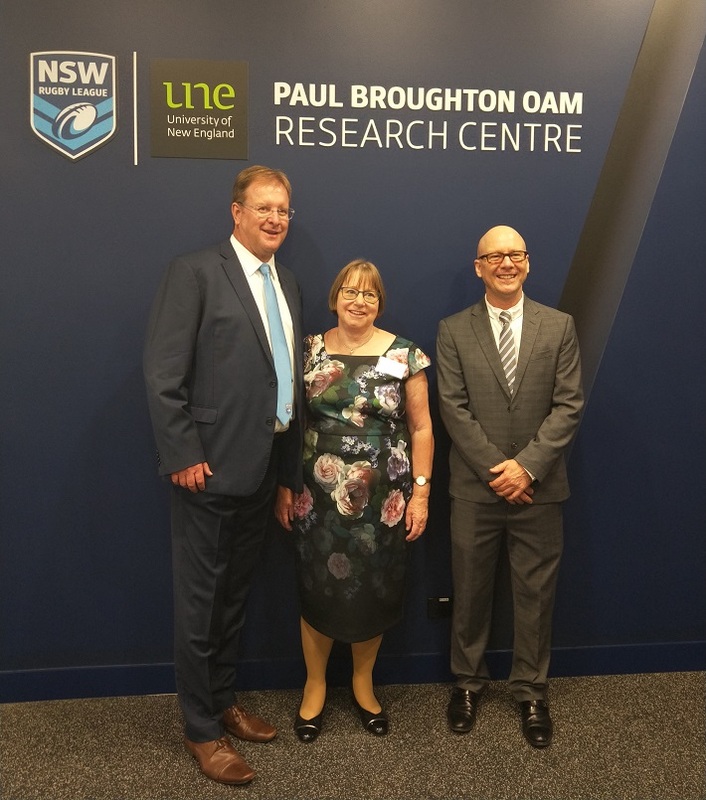 Image: (L-R) NSWRL CEO David Trodden, UNE Vice-Chancellor Professor Annabelle Duncan and Director of UNE Sydney, Robert Field, launching the newly opened, high performance Paul Broughton OAM Research Centre. The University of New England (UNE) has announced a unique extension of its sports-related teaching and research with the launch of a high performance research centre within the NSW Rugby League (NSWRL) Centre of Excellence at Sydney Olympic Park. The NSW Rugby League Centre of Excellence was opened by the NSW Minister for Sport, the Hon. Stuart Ayres. UNE has embarked on a 10 year partnership with NSWRL to provide students in UNE’s Exercise and Sports Science programs with additional opportunities to interact with elite athletes. UNE Vice Chancellor, Professor Annabelle Duncan, said that the state-of-the-art Paul Broughton OAM Research Centre will provide exciting opportunities for teaching and research programmes linked to a national, elite sporting team. “UNE will support NSWRL with research into player performance and development, and the partnership will also support regional communities with outreach and development programs,” Prof. Duncan said. “UNE pioneered flexible, remote learning. This facility continues that tradition by providing a presence in Western Sydney for use by all students who want to undertake intensives and short courses in our Exercise and Sports Science programs. UNE has a long history in bringing elite sport to Armidale, and UNE and NSWRL are collaborating to build opportunities for talented young players in regional Australia. Prof. Duncan observed that UNE’s education model provides dual pathways into a degree for talented regional players aiming for professional rugby league, but who want also develop a professional career. The Centre also includes a full size playing field, tunnel to ANZ Stadium, hydrotherapy pool, a lecture theatre, gymnasium with free weights, machines, aerobic areas and cardio equipment, an event space and administrative offices.